The following is a biographical entry from The Britannica Encyclopedia of American Art (1973). The section on Thomas Hart Benton was authored/edited by Alfred V. Frankenstein. Painter. Born in Neosho, Mo., Benton was the son of a United States Congressman and grandnephew of a famous senator. His youth was filled with discussions of the issues that were shaping the Midwest. He studied at Western Military Academy (1906-07) and drew sketches and cartoons for a local newspaper. In 1907, he took classes at the Chicago Art Institute, and in 1908 he left for Paris, spending three years at the Académie Julien. He was briefly influenced by cubism and synchromism [a movement relying upon color alone to provide both form and content of painting], but the conservative tradition in which he was brought up militated against his absorbing deeply the revolutionary modernist esthetics that were sweeping Europe. The most lasting impression left by his European visit was of the monumental works of the Italian Renaissance and the paintings of El Greco, especially the distortions of the human figure. Returning to the United States, he settled in New York, and in 1916 he participated in the important "Forum Exhibition of Modern American Painting." He showed paintings in which Michelangelo figures were stylized into compositions dominated by strong, linear rhythms and with color playing a subordinate, reenforcing role. In 1918, Benton was employed as a draftsman at the Norfolk, Va., Naval Base, and his attention turned to more realistic themes that reflected his rural and small-town background. The following year, he embarked on a series of paintings that he later called the "American Historical Epic." 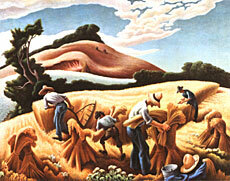 In these works, to which he devoted the next decade, [Benton] sought to forge an American art which would draw its themes from the history, folklore, and daily life of common American experience, and in which modernist principles would figure only to the extent that they contributed to a graphic clarity of style easily grasped by everyone. At first strongly influenced by the Russian Revolution and by the environmentalist theory of art propounded by the French historian, Hippolyte Taine, Benton's attitude deepened when he returned to Missouri for a visit shortly before his father's death in 1924; he began sketching and collecting material from life. By the end of the 1920s, he had crystallized his style and attitude, and throughout the 1930s he was one of the most popular and influential of American scene, or "regionalist" painters, whose numbers also included John Steuart Curry and Grant Wood. A parallel movement in literature was represented by such writers as Sinclair Lewis and Sherwood Anderson. Benton's ambitious mural cycles--in the New School for Social Research, New York (1930-31); Whitney Museum of American Art (1932); University of Indiana, Bloomington (1933); and Missouri State Capitol, Jefferson (1936)--created wide interest in regionalist painting. They influenced the policies of governmental art programs during the Depression, although Benton himself never completed any work for federal programs. An articulate spokesman for the regionalist point of view, Benton remained an outspoken critic of Parisian "modernism"; contrary to common belief, he regarded his histories as nonpolitical in nature, and he was scathing in his criticism of "social realists" who saddled their art with specific causes. In the mid-1930s, Benton left New York to direct the Kansas City, Mo., Art Institute, and he continue[d] to live in that city [until his death]. His work since the late 1930s [was] characterized by a new interest in textural qualities, and a greater refinement of color and clarity of design patterns. He worked briefly on a series called "Perils of War" during World War II, but he later returned to American scene subjects, and to biblical and legendary themes reinterpreted in vernacular terms. His [later] paintings . . . dealt with the Far West. A few more notes: Benton's first job was as a cartoonist for the Joplin American in Missouri . . . Another well-known mural is in the Truman Library in Independence . . . His most famous pupil was abstract expressionist Jackson Pollock (!) . . . He died in his studio on January 19, 1975 at age 83.